All we ever need is to be seen. To be heard. To be loved unconditionally and to know that we matter to the people we love. Yes we need this in romantic relationships, but we also look for it in every other relationship in our lives. With our friends, our parents, our siblings, etc. We seek this because when someone cares for us in this way, it breaks down the barriers of vulnerability and gives us permission to be ourselves. No mask. No need to hide or pretend we’re someone we’re not. Just acceptance for exactly who we are in all our forms. Sometimes this kind of love can even invite us to see ourselves in a new light with compassion instead of shame. And when we receive this kind of love, it transforms us. It changes us from the inside out. If you’ve ever been loved in this way, then you’ll know the feeling. If not, don’t give up hope. Keep looking, keep searching, but most of all keep believing. Because truth is, it’s out there, you just have to know what you’re looking for. 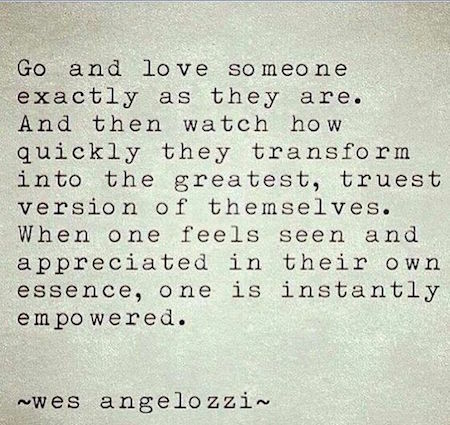 And while you’re waiting, think of how you can give this kind of love to others and watch it transform them. Maybe dare trying to love yourself unconditionally and see what you find.